The civilization of Ancient Egypt lasted longer than the entire span of what we have come to accept as 'recorded history': over three thousand years. 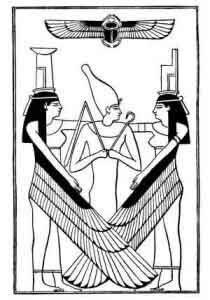 During these millenia the Egyptians developed a multitude of gods and goddesses, as well as esoteric practices that we are still unravelling the meaning of. Besides this, Egypt was the source of the first true monothestic religion, under the pharaoh Akhenaton. This rich tradition was mostly unknown until the early nineteenth century, when the Egyptian language was finally deciphered. Samuel A. B. Mercer, translator . The oldest sacred text in the world that we know of, dating back to 3100 B.C.E. The Pyramid Texts are funerary inscriptions from the early pyramids. This was the first translation of the Pyramid Texts into English, and this etext is the first time it has appeared on the Internet. by James Henry Breasted . Millennia of Egyptian religious evolution as seen through their literature, including extensive quotes from the Pyramid Texts. E. A. Wallis Budge, translator . The best known Ancient Egyptian sacred text, which describes the journey into the afterlife. A journey through the night side of the Ancient Egyptian cosmos. by E. A. Wallis Budge . Also known as "The Book of the Opening of the Mouth", this book contains a large extract from the Pyramid Texts, the oldest known Ancient Egyptian sacred text. A late Egyptian magical text originally written in Demotic. A translation of a set of hymns to the goddess Isis. The famous monument which opened up the Ancient Egyptian writing system: with extensive background material and a full translation of the text. An attempt in late antiquity to explain Egyptian Hieroglyphs as pure symbols (very unsuccessfully). Noted for its influence on later occultists. Translations of mythological and historical texts from the Ancient Near East. E. A. Wallis Budge . Thousands of years of tales of Egyptian Gods and Goddesses. A taste of Ancient Egyptian mythology, by the trailblazing scholar Margaret Murray.